Cleaning. Known for throwing away the old and used. Unfortunately, many people think dogs are in that category as well. With the dedication and devotion from people like you, we can save, nurture, and love these, so-called throw-aways, and give them back their self worth and reap their love in return. Moxie was by my uncles side, in the hospital bed every minute-not wanting him to be without her. It was so hard to see, but so amazing & special. Please accept this on behalf of them both! Chris and Patti Wieland - Seeing Maggie lets me see what Gracie would have been like if she had not been taken by nasal cancer two years ago, at the age of 12. 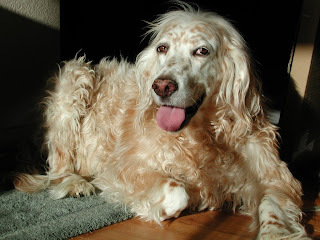 She was a greeter at the veterinary hospital where her mother, Dr. Julie Smith, worked in Fort Collins, CO. In loving memory of a dear sweet girl. 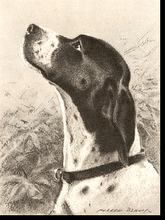 Maureen Koziol made a donation in honor of Wally. Michelle Davis's donation for Belle's HW treatment is much appreciated. 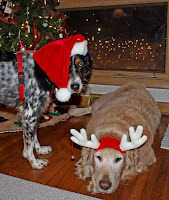 Her 2 loving dogs Honey and Ginger are pictured here, waiting for Santa.